Creating a "pet-friendly" hospital, shelter, or pet-care business is a simple, inexpensive path to improved efficiency, increased staff safety, happy pets, and clients who feel a bond with your business. Learn how in this fun and fascinating DVD version of Dr. Yin's popular seminar. Anyone who regularly handles dogs and cats—veterinarians, veterinary and pre-vet students, trainers, behaviorists, groomers, shelter staff, pet foster parents, and of course pet owners—can benefit from the principles and hands-on techniques taught in this seminar. Need to train your staff, but short on time and money? This accessible, high-quality DVD is especially suitable for quick, cost-effective group training. 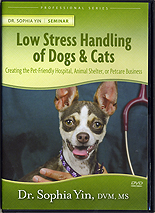 With the help of "Low-Stress Handling of Dogs and Cats," you can ensure staff participation, limit your liability, and transform your practice in just an afternoon. Dr. Sophia Yin earned her Master's in Animal Science in 2001 from UC Davis where she studied vocal communication in dogs and worked on behavior modification in horses, giraffes, ostriches, and chickens. During this time she was also the award-winning pet columnist for the San Francisco Chronicle. Upon receiving her degree focused on animal behavior, Dr. Yin served for five years as a lecturer in the UC Davis Animal Science Department. Through these and an eclectic collection of other animal behavior experiences, she came to realize the true secret to successful behavior modification.